I have just listed a favourite file of ours - Dog and Bones on TeachersPayTeachers. Click on the image above to check it out. 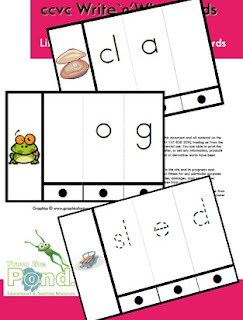 I have updated the resource to include two new worksheets. If you are one of my Australian followers who has purchased this item from us in the past, contact me and I will send you the new worksheets. 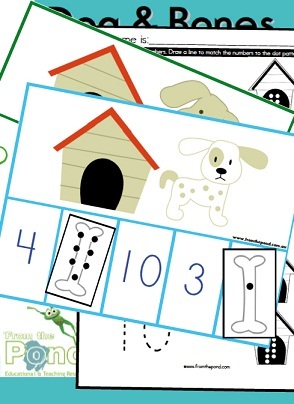 I created some fun new dog house graphics for the worksheets as I wanted them in black and white - what a great opportunity to create a freebie for all my wonderful blog friends I thought! 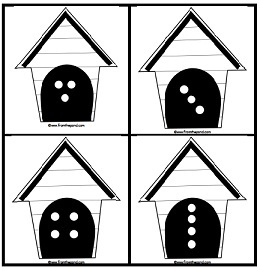 So here it is - Dog House Dots. It will help your students to subitise (subitize in USA???). Subitising is the ability to recognise number dot patterns in different arrangements. Instantly recognising dot patterns will help your students to work on harder mathematical concepts such as addition and subtraction. They will be able to hold, and work with, a mental image of a number. I do lots of work with dot patterns in my classroom. It really helps! Not only can you play games and activities with dot patterns, but a simple daily drill excites my class. I turn it into a fun and very motivating lesson transition my "flashing" a set of dot pattern cards very quickly to the class, and they can call out the number if they know it. At the beginning of the school year I will start quite slow, and then get faster. Also, they enjoy sitting at their desks with a tub of plastic counters (chips) and trying to re-create the pattern that I hold up. ﻿Download our new ccvc resource from TeacherspayTeachers for FREE for the next 2 days only. What a month I have had! 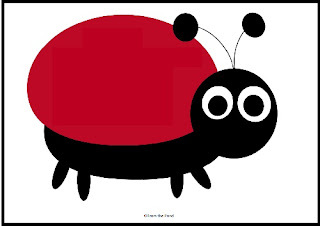 I am working full time currently, and having a wonderful time, apart from catching a few little colds and bugs and being laid up in bed by 4.30 most afternoons! My class of kinders are about half way through their first year of school, and the progress that they have made is amazing. It happens every year, and is one of my favourite things about teaching in the early years. ﻿I love watching everything start to "come together". It certainly is the perfect reward for months of hard work. I am also in the midst of a dusty, smelly, cramped building zone, as we are making our little house a little bigger. It all started 4 years ago, when we added a delightful little girl to our family................and the toys. It seems that toys, books, games...and all-things-little-girl were starting to take over our house, so we had little choice left that extend the house or move. I am very excited as tomorrow we get stairs fitted in the house - no more ladders or walking outside and around the house to get to my computer! I am also teaching my kinders all about subtraction and take-away. Perhaps I can tell them about the ladder being taken-away! Anyhow, here is a little activity I have put together to help introduce the concept to my learners that are still right at the beginning of their understanding of subtraction. They still need to see, touch, count and manipulate objects and numbers. I hope you like it - download it for free by clicking on the image above.